In June, the latest Occupy movement began in Portland, Oregon, demanding the abolition of ICE—Immigration and Customs Enforcement. So far, the only thing that the large Occupy encampment in the Rose City has taken down is a small business across the street whose profits went to feed the homeless. Some of the Occupy ICE radicals who have set up a tent city outside Portland’s ICE headquarters—most of them drawn from the ranks of and supported by Marxists, socialists, Antifa, anarchists, and the homeless—recently targeted the Happy Camper, a food cart run by Scott and Julie Hakes right across the street from ICE and the sprawling Occupy encampment. The food cart is part of the tax exempt 501(c)3 organization that the Hakes’ set up to assist homeless people. In recent news broadcasts, three of Portland’s TV stations reported that Occupy ICE protesters allegedly began targeting the legal operation of the Happy Camper for harassment—most likely because employees of ICE were observed to be eating there. The Hakes’ claim—supported by cell phone videos, according to the television news reports—is that that they have been harassed and threatened with violence by people from Occupy ICE. Their customers have also been harassed, and their business is down about 80 percent as a result, according to Scott Hakes. The Hakes family insists that they have reported the harassment by people from Occupy ICE to Portland police. However, Portland’s mayor has ordered the police to stand down as far as the Occupy ICE tent city is concerned. No action by the local police has been taken to protect the private businesses in the area that have been affected by the ongoing Occupy tent-in. With their business way down, the Hakes’ have decided to close their The Happy Camper business and try to sell their food cart at a substantial loss. It is ironic that a federally-approved non-profit dedicated to helping some of Portland’s homeless population would be a casualty of the Occupy Movement, which advocates for a variety of social justice aims in addition to the abolition of ICE—including no borders and no prisons. Many Democratic Party politicians at the local level, including Portland’s mayor and members of the city council, are on the record supporting the stated aims of the various Occupy ICE encampments that have sprouted up in at least a dozen cities. 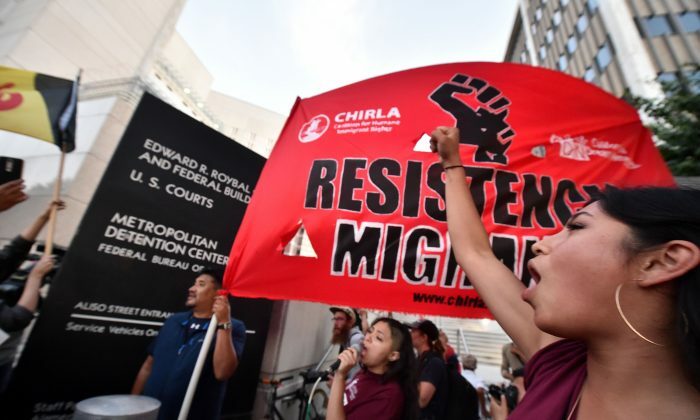 A number of prominent national Democratic politicians have also endorsed the Occupy Movement’s demands calling for ICE’s abolition.